Alabama requires all Home Medical Equipment Service Providers (HME) must obtain a license before they can operate in the state of Alabama. Home Medical Equipment Services is defined as “the delivery, installation, maintenance, replacement of, or instruction in the use of medical equipment and related supplies used by a sick or disabled individual to allow that individual to obtain care or treatment and be maintained in a residential setting.” See AL Board of Home Medical Equipment Services Providers Law, Section 34-14C-1. A copy of elevator permit (where chair/stair lifts supplied). The Alabama Board of Home Medical Equipment (HME Board) has recently passed and attached the Emergency Rule to Act 2014-172, which pertains to a new in-state physical location requirement. Effective June 1, 2014, all out of state Durable Medical Equipment (DME) licensees must have an AL location. Currently licensed out of state providers will have until the expiration of their licenses on August 31, 2014 to demonstrate compliance with the new location requirement. 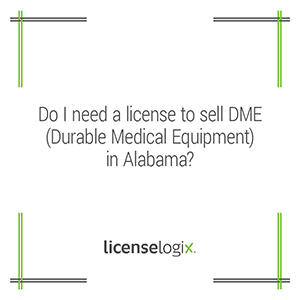 If you are not currently license, LicenseLogix will begin the Alabama DME licensing process TODAY. If you are licensed, let us store and handle all renewals in our easy-to-use web portal CLiC! To get started, fill out the form on the right or give us a call at (800) 292-0909.